HR, corporate development, and employee training are rapidly approaching a new reality that’s as much science fact as science fiction. 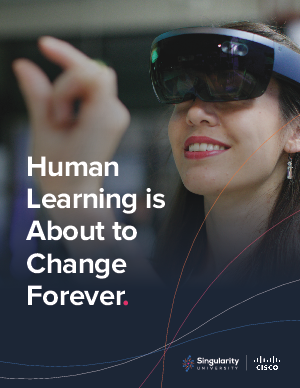 “Human Learning is About to Change Forever,” a white paper we researched in partnership with Cisco, shares nine bold predictions about how technology will impact employee training and leadership development. The skillsets leaders require will be vastly different, as will their learning methods. Consequently, HR and Learning & Development leaders must reexamine how they train employees and groom future leaders. Singularity University's tools and leadership models can help future-proof your organization to tackle the coming changes and seize new opportunities.